By John F. McKenna (McJack): In an article in the London Daily Star, World Boxing Association (WBA) Champion David “The Haymaker” Haye (25-1, 23 KO’s) says he has dumped his trash talk and no longer needs it to sell his July 2 unification fight with IBO, IBF, WBO and Ring Magazine Champion Wladimir “Dr. Steelhammer” Klitschko (55-3, 49 KO’s). The Londoner insists that he has not suddenly gone soft and that he has no regrets about insulting his opponents and fans even if it has turned some of them against him. Haye admits that the trash talking was done to gain exposure and sell tickets as he progressed from Cruiserweight Champion to WBA Heavyweight Champion. In essence what David Haye is acknowledging is that the ends justifies the means. Vladimir Klitschko is still raging from the stunt Haye pulled in 2009 in which he showed up with a Tee shirt depicting the decapitated heads of the Klitschko brothers. In another instance “The Hayemaker” referred to the Ukrainian brothers as the “Bitschko’s” to their faces. Haye was quoted as saying “People might think it’s disrespectful and distasteful, but it has gotten me to where I am today.” The quote is another indicator that as long as David gets what he wants it matters little who he hurts in the process. Haye also said that a lot of the things he says are tongue in cheek and it makes a good headline and an entertaining fight. “Nobody wants to see two anonymous guys that nobody cares about.” Haye went on to say that when he was doing a lot of the antics he is now famous for, he was not a challenger and he was an unknown. Haye said “I was doing those things to get attention and get noticed. Me doing those things got me noticed and allowed me to bypass those five or six mandatory nobodies to get a title shot. I had one fight with Monte Barrett, then I was straight in there fighting for the title against Nikolai Valuev. Wladimir Klitschko has been saying for quite some time now that David Haye is not deserving of the July 2 title shot against him and that he had talked his way into it. Based on Haye’s interview with the Daily Star it appears that “Dr. Steelhammer” is right on with his accusations. 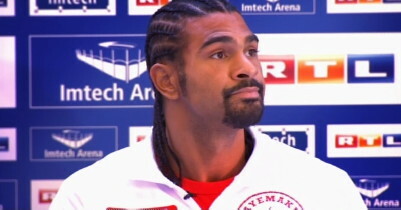 Haye not only talked his way into a title shot with Vladimir Klitschko, he negotiated a 50-50 split of the revenue. One might wonder if many of Haye’s antics were done tongue in cheek as he says, does he really believe in his own heart that he can defeat Vladimir? With Haye’s fight with Klitschko looming less than two weeks away on the horizon, he undoubtedly is searching his soul and wondering if he will remain intact and reap the rewards of what he has sewn.